My dad hastily grabbed me up off the ground and pulled me by my frail little arms to the river's edge. I could hear my mom screaming "No, Wayne! No!" Within seconds my brother tackled my dad and knocked him in the river--but not before he was able to unload a half-gallon of gas on my head and body. My dad was drunk and high–and so angry at my mother that he was willing to pour gas on me with the intention of setting me on fire to spite her. I was four years old. Addiction had a profound impact on me before I ever picked up a drink. I'm Native American and come from multi generation of addiction. I have a roll number--3743--which was established by the Bureau of Indian Affairs to preserve the unique character and traditions of the tribe. The tribes establish membership criteria based on shared customs, traditions, language and tribal blood. My own personal journey in and through addiction was one of cruel and punishing consequences to myself and those around me. My addiction took me to a deep and dark place where the light did not shine. The details of my life experiences are familiar to anyone that has dealt with addiction themselves, family members, friends or known someone with an addiction. I was given the gift of desperation in July 24, 2004. But not until I chugged a 1.75 liter bottle of vodka in just a few minutes. Something was different that day from any other day I've ever drank in my life. Alcohol had always been the great equalizer. Killed the pain, calmed my feelings, gave me a sense of security. Even after drinking that much alcohol, my fear, anxiety and pain did not go away. I was left with the sick feelings of alcohol withdrawals and thoughts that my greatest love and best friend was not going to kill the pain any longer. I realized that alcohol had not been my problem--it had been the solution to all of my problems. My love turned on me. I wanted to die that day. What happened next can only be described as a miracle. I walked into a recovery meeting and uttered those three magical words: "I need help." It was like letting a genie out of a bottle: you can never put it back in. The awful disease of alcoholism had brought me to my very knees--exactly where I needed to be. Up to that point in my life I had very little humility, and virtually no honesty. "Our wounds and sorrows are healed only when we touch them with compassion." My cry for help was answered with amazing love and compassion. Finding recovery was like finding a priceless treasure that would give me more than I could have ever imagined. The very foundation of recovery is based on being connected, love, compassion, honesty, shared experiences, and knowing that we are not alone on this journey and could be forgiven for what we believed to be the unforgiveable. Although my entry into recovery came with a tremendous amount of guilt, remorse and shame, after a while the pain subsided. I heard other men and women share about their struggles. Their stories gave me hope. If other men and women could overcome these deep sorrows and daily using, so could I. I picked up the tools of recovery, made a decision, and followed my fellow travelers on this road called recovery. When I was a child and young adult, I had big dreams of what I wanted to do with my life. Those were derailed by my addiction. For much of my life I thought my dreams of going to college, owning my own company, building lasting relationships, traveling the world, and being present for my fellow man simply weren't going to happen. I came into recovery to try to stop drinking. I stayed because I got to live. I went on to get that college degree. Not one but two. I did realize my dream of starting my own company that's entire purpose is to be of service to other businesses, thus serving my life's purpose. I was able to repair much of my past and become a present father for my son. If someone would have asked me to plan my recovery, I would have left so many little miracles out. Recovery has not been perfect. After putting the drink down I discovered I was left with raw emotion that was swirling in me like a tornado. I would go from happiness to anger, sadness, anxiety, remorse or shame in a matter of minutes. It took me a while for me to learn how to respond rather than react. Struggles are normal part of life. Today I don't have to drink over those struggles. I've gone through many, many ups and downs in recovery. I've lost family members, job issues and health problems to name a few. The longer I've stayed sober, the more my recovery has changed. Issues I dealt with in early recovery were not issues I dealt with a few years into recovery. The difference is; I have the tools to deal with the issues today. My life today is about emotional recovery. Recovery has been like peeling layers of an onion. Every time I peel back one layer, there is another. I had many emotional breakdowns while in recovery. But I have never had to pick up a drink. Uncertainty today does not mean run to the liquor store. Uncertainty today means I have an opportunity to learn something, use the tools I've learned, and grow in my humanness. Today I can feel the feelings, no matter how scary. I'm not the first to be afraid nor will I be the last. I have discovered a true power and it is universal and abundant, and I can tap into at any moment. The Lakota have a word for what I feel, Mitakuye Oyasin, or, "All My Relations." I feel connected and full of life today. I have hope and am inspired by the men and women that chose recovery--life--today. 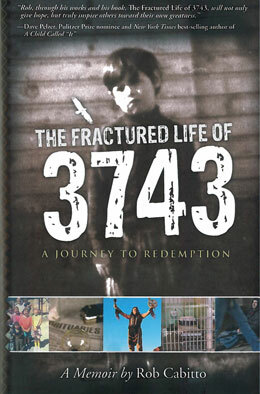 Rob Cabitto is the author of The Fractured Life of 3743 distributed by Hazelden Publishing.